UPDATE: Iran and the six world powers also need to overcome two core issues still under consideration in order to reach a political framework agreement, Laura Rosen of Al-Monitor reported Sunday night from Lausanne. They involve the scope of research and development that Iran could conduct in years 11-15 of a 15-year agreement, and what happens on UN Security Council resolutions. UPDATE: Iran’s senior nuclear negotiator Abbas Araqchi told reports on Sunday in Lausanne that Iran will not send its current stockpile of enriched uranium abroad for conversion into power reactor fuel. The transfer of enrich uranium abroad, most probably Russia, has been among key demands of all members of P5+1. If Iran sticks to its position, then to ensure that the breakout capability is not shorter than one year, Iran would need to agree to much lower number of centrifuges that would be allowed to operate. Tough choices. Western reporters at Iran talks in Lausanne are reporting as of Sunday afternoon local time that the two sides are seriously exploring compromises to break an impasse in nuclear talks. 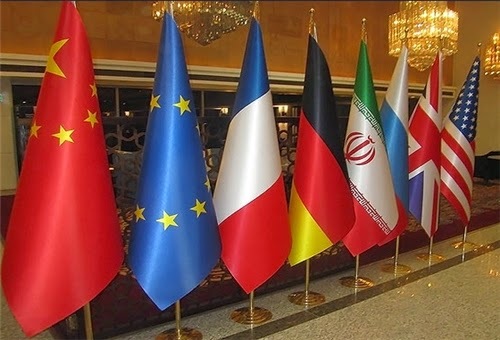 A plenary session of foreign ministers of Iran and six major powers will convene later today to approve possible compromises that would form the basis of a political framework agreement, with technical details worked out before 30 June deadline for a joint comprehensive accord. FWIW, there are reports of compromises in the making this afternoon, which include Iran’s acceptance of having fewer than 6,000 centrifuges and shipping nearly all its current stockpile of enriched uranium to Russia for conversion into nuclear reactor fuel. The P5+1 would in return allow continued operation at Fordo enrichment facility, albeit limited to R&D work for medical purposes under close monitoring of IAEA. The duration of the agreement, the so-called sunset clause, is said to be 11-15 years, containing different duration for different elements of a deal, with additional protocol and modified code 3.1 to NPT obligations lasting forever. UPDATE: AFP quoted Iran's senior negotiator Abbas Araqchi as saying that Iran would never accept the demand by the P5+1 to send its stockpile of enriched uranium abroad. With the stockpile kept intact in Iran, the P5+1 might demand much lower number of operating centrifuges allowed, which Iran might not be willing to accept. In the last hours of negotiations, they are taking one step forward and one backward, the German foreign minister observed. UPDATE: P5+1 and EU tonight held meeting among themselves for the first time since November extension of interim agreement, JPOA. UPDATE: The plenary session of foreign ministers of Iran and six major powers will be held on Monday morning at 9 AM local time. The meeting was originally scheduled to be held tonight. Is any nation obliged to promise something forever ????????????? It may apply to regimes who commited murders, genocides, or such puppets, who for instance promised their lands (Guantanamo), forever,......to their masters. It is interesting that there are no any information when and what kind of sanctions will be lifted......but other numbers and speculations. I am wondering, why the authors and their 'friens' haven't accentuated earlier those aforementioned aspects in their 'discussions' ??? NPT itself is forever. When governments sign NPT, they sign it forever, not just for the duration of their term in office or their regime. So the Additional Protocol or MOD 3.1 could also be forever, like the NPT itself. It's within international law. Your question probably should be if agreeing to additional protocol or mod 3.1 is in Iran's interest. if you wish to sign your comment " A-F, Disident from usa"
There is nothing forever, except the GOD. You cite something like " FWIW, there are reports of compromises in the making this afternoon, ...... containing different duration for different elements of a deal, with additional protocol and modified code 3.1 to NPT obligations lasting forever." Are there any names which indicate who proposed that the additional protocol and modified code 3.1 to the NPT obligations will have to last forever in the Iranian (Islamic Republic) case ? Are they a vishes of those who don't want an agreement and those, with their supporters there and here, who dream to take the Islamic Republic on a "hook", and "haul" it like a fish to the shallow waters, (like it was said by some people earlier). I had wished for an agreement, and it is for a wisdom of the people living inside the Islamic Republic, to create their own decision in that matter. In addition to the Supreme Leader, they have many excellent thinkers who see a common good for their nation people and futre, and don't need ill wisher's advices . The recent need to hasten negotiations from Obama's administration, stems from an absence of any significant successes in his foreign policies as well as a coming end of his presidency. Because of that two objectives have emerged, where one is to be praised in a history, after they (Obama) commence the "agreement", regardless what happens to it later, and the second objective is to give his party an argument in coming elections that we took them (Islamic Republic) on a "hook", and whoever is a next, may finish: or not finish: that job, according its wishes. I would like to point out that the NPT envisioned that its creators will commence a process of total elimination of nuclear weapons, including themselves, but instead of that the usa helped (in hiding) and is assisting some countries which ignored the NPT and acquired nuclear weapons. Is any other country in the world, which is obliged by similar "additional protocols" to the NPT, and are they bound forever ?? Do not waste your time, and instead better learn history to make some valuable conclussions, unless you are paid and make good living for your comments. Be also informed that there may be some malwares which follow me, and may change some letters in words, in order to ridicule me like it was apparently in your reply.